All the youth attending the talks here in Bangkok gathered for a press conference this afternoon. Below is our press release. INTERNATIONAL YOUTH SOUND THE ALARM: WE ARE ON ROAD TO FAILURE! International Youth has declared “No Confidence” in the road to Copenhagen. 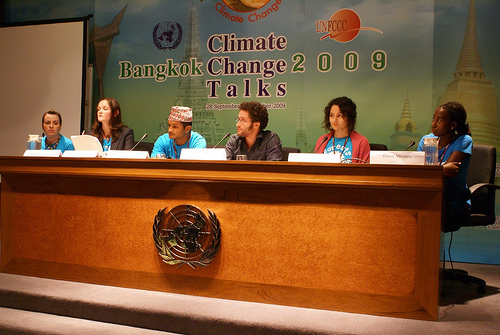 Bangkok – A declaration of “No Confidence in the Road to Copenhagen” was announced today by the International Youth Delegation attending the UN climate change talks. The delegation cited the failure of reaching a commitment from developed countries on strong targets, a growing concern that a second commitment period in the Kyoto Protocol will not be secured, and a lack of guarantees for protection of Indigenous peoples’ rights and interests, in its Declaration. The current text of the draft climate deal is so weak and so full of “false solutions” – measures like offsetting that actually make the problem worse – it is currently unacceptable. One young person from each continent, organizers from an international youth climate movement of hundreds of thousands, addressed those attending the negotiations today. With less than two weeks of negotiations remaining before the Copenhagen meeting, the pressure is on developed countries to commit to providing finance and at least a 40% reduction in emissions by 2020. “If they do not, we will witness the derailment of this climate deal in Copenhagen,” said Grace Mwarua from Kenya. 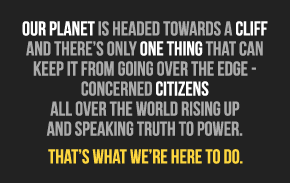 ← Where are we at?